Sehen Sie den goldenen Tempel von Amritsar, Jallianwala Bagh und die abendliche Zeremonie der Wagah-Grenze auf dieser ganztägigen Privattour. Betreten Sie den Goldenen Tempel, die am meisten verehrte Stätte der Sikh-Religion, und erfahren Sie mehr über seine Geschichte und den See. Dann besuchen Sie das Jallianwala Bagh-Massaker-Denkmal. Nach dem Mittagessen und Einkaufen in den Basaren können Sie die abendliche Beating Retreat-Zeremonie in Wagah an der Grenze zwischen Indien und Pakistan beobachten. Die Tour beinhaltet einen privaten Transport, einen Fahrer, Mittagessen, Eintritte und die Abholung und Rückgabe des Hotels in Amritsar. This tour covers the most important things to do in Amritsar. It offers the convenience of pick and drop and eliminates haggling with auto/tuk tuk drivers. The tour started on time and the guide was informative. She took us to Katra Jamal market where we could buy local spices, pickles, papad and the famed juttis. However, I feel this tour is over-priced as the destinations are nearby except Wagah border which is 30 kms away from the city, food is inexpensive and there are no entrance fees to any of the sites. Also, the guide didn't join us for the beating retreat ceremony. One might consider hiring a car for a cheaper price for the whole day instead. THIS TOUR PACKAGE IS VALUE FOR MONEY!! OUR TOUR GUIDE HIS NAME IS SULTAN IS FANTASTIC!! SPEAKS ENGLISH WELL, VERY PROFESSIONAL and NICE. GIVES US A LOT OF TIME TO GET PICTURES IN W/C I LOVE TO DO COZ I'M AN AMATEUR PHOTOGRAPHER. It was a great trip for my family of 3. We were very comfortable with our guide, Lazia. We visited the Golden Temple, Jallianwalla Bharg, had Dabha lunch, Wagah Border and some shopping. 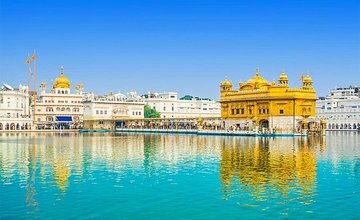 She displayed good knowledge and brought us to every part of the Golden Temple right to the langgar and roti making machine. The Wagah Border was very exciting. Guide was very punctual. I would recommend this tour to others. People must know that they due to border restrictions, we have to walk about 20 minutes. No vehicles are allowed. We were aware of this and tour was wonderful. Will go again perhaps next year. My friend and I enjoyed this tour so much and our guide was just delightful, the driver skilled some of the traffic was pretty chaotic with all the current old town roadworks. The Golden Temple is so serene and tranquil in contrast to the Border Ceremony which is noisy and fun. Lunch in a local restaurant was delicious. Thanks. We were met by the guide and driver one hour late then the given time. The worst was that we were told that the walk from the car park at Wagah Border was just couple of minutes. When we got there we were left at farther end car park from where we had to walk almost 25 minutes to the border. Also we were told that we will be watching from VIP gallery and we were quite away from there. Once in the car park, we were just given directions as to where to go and meet again in the car park after the ceremony was over. All we were provided was the transport back and forth to the car park. We could have done this ourselves without hiring the services of a guide. Tour to the Golden Temple, however was good.